A court has stepped into a row between mobile phone network operator T-Mobile and wi-fi phone firm Truphone. Truphone had accused T-Mobile of hindering its service, by blocking calls made to numbers owned by the fledgling mobile operator. In the High Court on Monday Truphone was granted an injunction to force T-Mobile to put the calls through. In court documents T-Mobile had said it had offered Truphone a deal to route its calls, but that had been rejected. However, the court also ruled that T-Mobile would have to pay Truphone a smaller share of the call fee than originally demanded. The so-called termination fee has now been set provisionally at the level that T-Mobile originally proposed. The Truphone service works by routing calls via wi-fi when handsets are within range of wireless hotspots the phone can connect to. 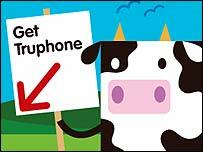 By using the wi-fi and the net Truphone hopes to cut mobile call costs - particularly those made to overseas numbers. In its court documents, Truphone said T-Mobile was "abusing its dominant position" by not putting its numbers through. Deputy High Court judge Robin Knowles QC granted an injunction requiring T-Mobile to activate the Truphone numbers. He granted the injunction until the two companies can either agree terms together, or have the courts decide how the matter should be resolved.